One of the best parts of my job is the interesting people I meet. Earlier this month I had a delightful conversation with Grand Rapids knitter, Virginia Loukus, who happened to be sporting a hat embellished with a knitted dish scrubbie when she stopped by my booth at the Fulton Street Artisans Market. As a big fan of unconventional fashion statements, I was amused and intrigued by Virginia’s headwear. I jotted down a few notes and followed up with a phone interview. Turns out Virginia really likes to knit scrubbies to use herself and sell to others. You can read the column I wrote about her and find her scrubbie pattern in the Home section of Sunday’s edition of The Grand Rapids Press. You can read the electronic version here. Virginia inspired me to use up some of the nylon netting I had left over from a tutu project that ended in disaster and whip up a few dish scrubbies. I demonstrated how to make them (with Virginia’s blessing) this morning on WZZM Channel 13’s “Take Five” show this morning. 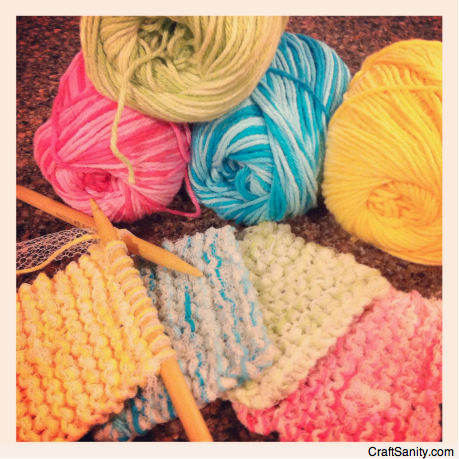 I invite you to knit one yourself and then weigh in on the fair pricing debate. What is a fair price for a dish scrubbie? How much would you charge? How much would you be willing to pay? Thanks for sharing your story, Virginia! Thank you, I have just been searching for information approximately this topic for a while and yours is the greatest I’ve came upon till now. However, what concerning the conclusion? Are you sure about the source? Do you mind if I quote a couple of your articles as long as I provide credit and sources back to your site? My blog is in the exact same area of interest as yours and my visitors would certainly benefit from some of the information you present here. Please let me know if this alright with you. Many thanks!